Tanzania and Kenya have one of the largest populations of Giraffes in the world. Specifically, there are three out of nine species that are dominant. Rothschild, Masai and Reticulated, and all of them are as wonderful to photograph as they are to watch. Photographing Giraffes. I can’t get enough of them. They are so graceful and beautiful. When they run, it’s like they’re in slow motion. When they look at you, you can see their beautiful long eyelashes, their gorgeous, soulful round eyes and their cute little alien antennae. I had the honour of visiting the Giraffe Centre in Nairobi, Kenya a couple of months ago where I got to actually touch, feed and even KISS a giraffe! We had tried to book in for lunch at Giraffe Manor but it was fully booked. If you’re planning on dining with Giraffes, make sure you book well in advance because it is a very popular place. However, if, like me, you didn’t have too much time to book, you can see the same Giraffes from the Manor a few doors down at the Giraffe Centre. I’ve been obsessed with Giraffes ever since I went on my first African Safari in 2013 and since then I have observed them in 5 different Safari/Game parks throughout Tanzania. The best thing about them is that they are not shy creatures. You can get quite close to them in a park if you have an excellent guide/driver. The first time I saw a Giraffe was the ultimate “wow” moment. The sheer stature they stand with is amazing. And then, you see them run! There’s nothing like seeing a Giraffe run. Interestingly, they are as curious about us as we are about them but they DO like to headbutt, so getting too close and letting your guard down can lead to a bit of headache. It was interesting to see that all the Giraffes at the Giraffe Centre have very distinct personalities, and because their patterns are as unique as fingerprints are, the rangers know all of them by name. To be able to use a 50mm lens on an old Canon AE-1 was a wonderful thing, but it is also beneficial to have a long lens for the parks. Here are a few tips I can share about photographing giraffes in game parks or sanctuaries. Be ready. Have your camera turned on and ready to go. Some cameras have a lag time between turning on and being ready to use. Use back button focus if you camera has it. Focusing with your thumb will make you quicker when you need to be. If you’re using a film camera, make sure that the lenses you use support it, or your images might be soft. If you like to shoot wide open, you might want to reconsider and choose a narrower f-stop if you’re using a telephoto lens and you are lucky enough to have a 2.8 f stop, you might end up with hazy shots. Try a 4 or 5.6 f-stop instead. Get a good guide/driver. A good one will know to stop as soon as he sees your lens raised. Don’t miss sunrise or sunset. Giraffes will often come closer to some camps during these times. Giraffes will always be found where there are Acacia shrubs, but they camouflage well so look carefully. Stay away from blue coloured clothing. The Tsetse fly is attracted to it and their bite is nasty. Giraffes are normally in groups, which is called a Tower. Try and position yourself so that all heads/necks are visible to avoid crowded looking photos. 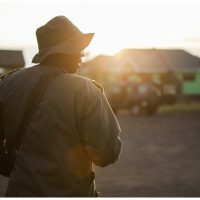 Get your guide/driver to shut off the engine of the Safari car. This will allow you to minimise camera shake, especially at longer focal lengths. Despite the urge to photograph giraffes in portrait orientation because of their height, use horizontal orientation as well to include their surrounds. If you see a Giraffe sitting/laying down, don’t hesitate to take the shot. This doesn’t happen frequently and when it does, it’s only for a few minutes at a time. 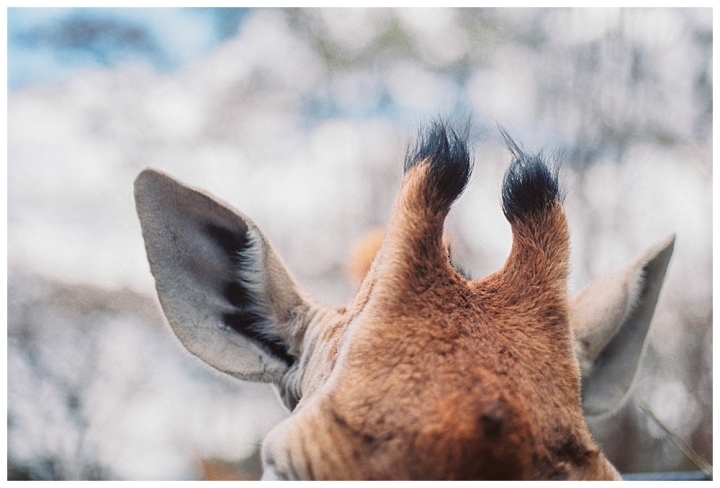 If you’re lucky enough to get close, try and photograph some details of the Giraffe. Their patterns, eyes, horns, tongues. Don’t touch or feed any wild animals. Always tip your guide/driver well. Make a visit to a watering hole in the hopes of capturing a Giraffe drinking. They only drink every few days. If you haven’t found any Giraffes, look for Zebras. They are usually seen grazing together. The images below were created using combination of both Kodak Portra 400 and Fuji 400H film and a Canon EOS 1v and a Canon AE-1. Using different films, according to the time of year you take your Safari can produce interesting results. The dryer seasons suit the Kodak Portra series of films and give lovely tones, especially when it comes to the warmer end of the scale. Head out in the wet or green seasons and try some Fuji 400H to get some fantastically rendered greens. Kodak Tri-x or Ilford HP5+ are fantastic films for creating some even contrast during the harsh daylight hours. Currently, the Giraffe is listed as “vulnerable” which means it faces a high risk of extinction in the near future. World Giraffe Day is officially June 21. To learn more about Giraffes or to make a donation to their conservation and well being, visit the Wild Nature Institute and the Giraffe Conservation Foundation. Every little bit helps. 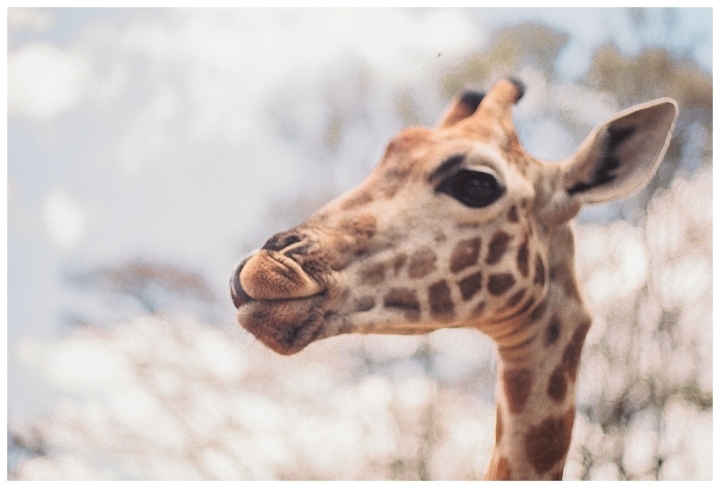 If you’re planning a visit to Nairobi, don’t miss out on Giraffe Manor and the Giraffe Centre for the ultimate up close and personal experience.